‘Well today was the first day of training at MP Fitness in Perth. I was a little nervous to meet Mike again but at the same time I was very excited to do a two week block, and determined to do my best. As usual I was warmly welcomed and I walked on my own into the parent room. After talking about how it was going, we walked through to the gym. It felt really good going in to the gym again. My mind started to look back at what I have achieved in this actual gym, like when I took my first steps on my own in my life and when I got into my small orthoses…..I have the memories of all the laughs we have had. For us it was amazing to see Alek attempting to run with Mike close behind. Some support round the hips and verbal prompts of how to do it had him running so fast he was actually panting for the first time in his life!!! Not a sensation Alek was too familiar with as his legs have always tightened to a stop before any training became really Cardio vascular. Mike had Alek try some new things stretching, focusing on the hamstrings and front of the calf. It’s great to see Alek working so hard and concentrating to remember…but what is also great is that it wasn’t only Alek that got to learn new stuff. To ensure the work Mike does can be continued at home, he had Mum and Dad touching their toes and working like Alek will with a new stretch and strengthening technique for the hamstrings. Mike got Alek panting on Monday, but Alek had loved the running so they were back on the treadmill working on getting the lift and kick right. 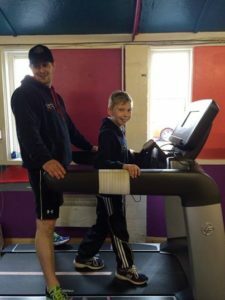 Some more running, walking backwards and focused strengthening and Alek’s session was over…..a quiet afternoon followed but by the time evening came Alek was tired and ready for a relaxing bath and a good sleep…. But then came the tough part… ending our sessions with Mike! I was concerned that while two weeks of Mike’s therapy was awesome, could we really continue to get even more out of it with Mike’s home workouts afterwards? The answer is, absolutely! We have been doing the home workouts for 4 ½ weeks now. In some ways, what we’re doing now, as many days a week as we can, to follow Mike’s plan, is producing even more dramatic results. The workouts are AWESOME and definitely nothing we could have come up with without Mike! Of course as always, what you put into it is directly proportional to what you get out of it. Almost every day my son will say, “Mom! Watch this!” and he shows me something new he can do or something he can do better than before! This in itself is so energizing that it motivates us even more. As you all know I’m sure, no one said SDR or the PT afterwards would be easy, but difficult things can be so incredibly rewarding as well. So please seriously consider making whatever sacrifices you need to in order to become one of Mike’s clients. We are convinced you won’t be disappointed!